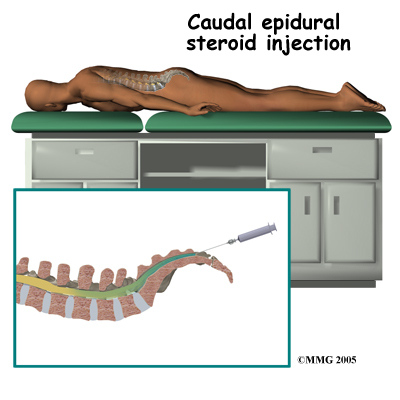 Welcome to The Avenue Clinic’s educational reference on epidural steriod injections. 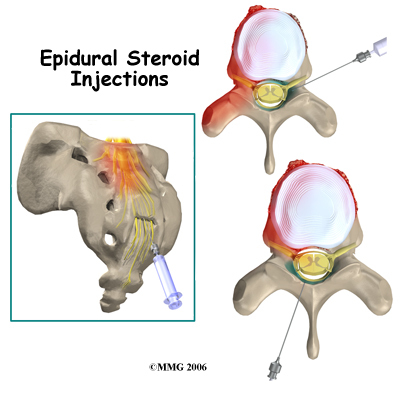 Epidural steroid injections (ESI) are commonly used to control back and leg pain from many different causes. These injections control pain by reducing inflammation and swelling. They do not fully cure any of the injuries they are commonly used for, but they can control the symptoms for prolonged periods of time. In many cases, the ESI is used to control the symptoms so that you can participate in a physiotherapy program, become more active, and be better able to control your chronic symptoms. 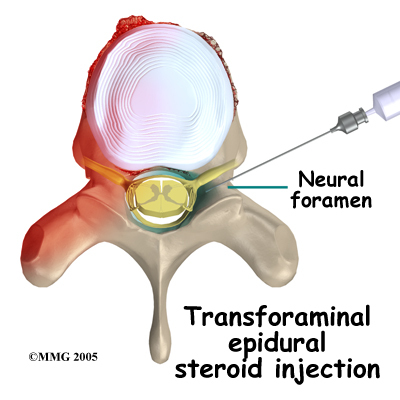 ESI injections are temporary and may last from a couple of weeks to a couple of months. 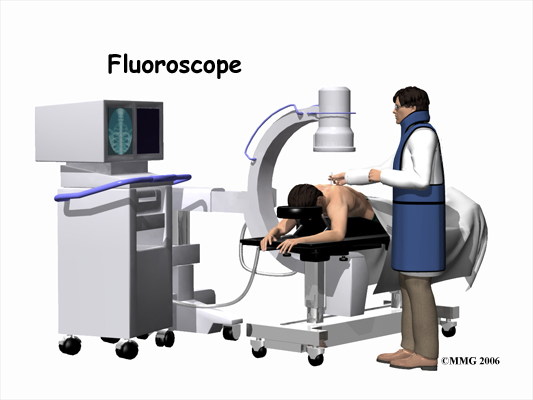 They may be used to reduce your symptoms so that you can more easily begin a physiotherapy program with less pain. They may also be used to reduce symptoms and let the body repair the underlying condition. 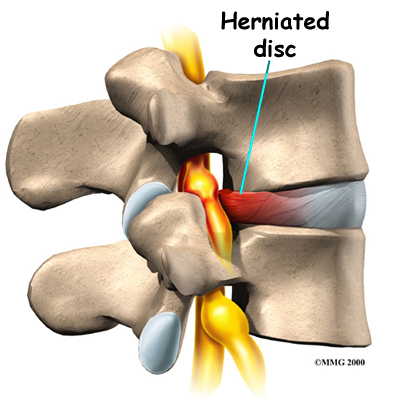 For example, most disc herniations cause a great deal of pain, particularly when they first occur. 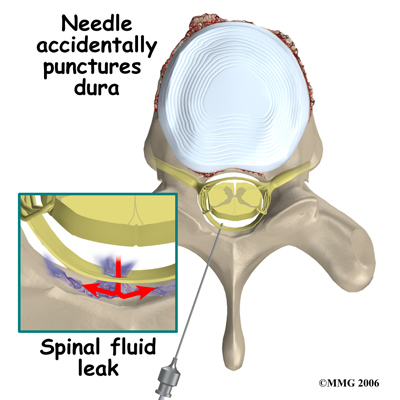 This is due to the chemicals that leak from the torn disc and inflame the nerves. Over several weeks to months, the disc heals enough to stop leaking these chemicals. If the cortisone can reduce the symptoms at the beginning, then when the cortisone injection wears off, the chemical irritation may be gone and the pain may not return. It should be noted that the cortisone itself does not heal the damage to the disc herniation itself. You can return to physiotherapy immediately. Unless your doctor recommends otherwise, physiotherapy at The Avenue Clinic after ESI can begin immediately. 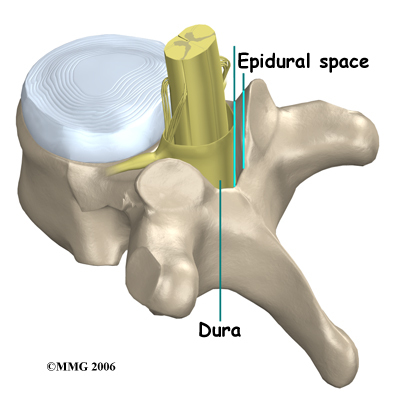 As indicated above, the ESI is done to try and reduce your pain. 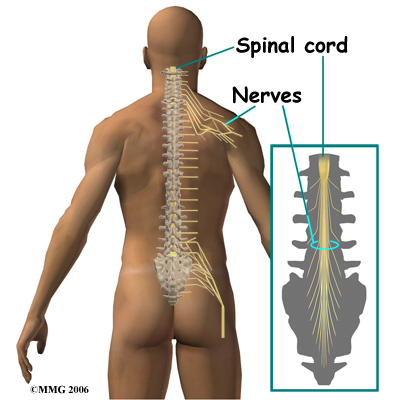 The pain in your back, however, can be from a variety of different injuries therefore the rehabilitation treatment you receive at The Avenue Clinic will vary according to what structures are involved in causing your back pain, and your treatment will also be tailored to suit your specific individual needs. In order to know how best to treat your individual back problem, your physiotherapist will assess your back and will determine how well your back is moving as well as determine if you have any muscular imbalances affecting your back. They will also take note of any other symptoms you feel such as tingling or numbness and will test for any muscle weakness that may be present in your low back or legs. If it is determined that the movement in your back is limited, your therapist will work to encourage more motion. In order to do this they may use joint mobilizations or manipulations, performing passive stretching, and massage any tight muscles related to the area. Stretches and strengthening exercises as part of a home program will also be prescribed as they can help you gain more motion in your own back, improve the strength and endurance of the muscles that help to support your back, and work to correct any muscle imbalances that may exist. These exercises will be targeted at your low back directly, but may also include exercises for your abdominals and trunk (core) area, buttocks and hips, groin, and the front and back of your thighs. Maintaining a strong core muscle area is the most crucial part of managing your back pain and allowing you to maintain as active of a lifestyle as you can despite any chronic pain. Your physiotherapist can teach you how to properly activate the core muscles and build up their strength and endurance. Even just simple exercises such as gently tightening the muscles of your deep abdominal area directly after you have undergone your injection will help to support your back. If your therapist has assessed your back and deemed it to be relatively moving too much, then the core exercises prescribed are even more crucial. Stretching exercises that target the tight muscles, which may be pulling your back into an adverse position, will also be prescribed. As you improve your activation, strength, and endurance of your core muscles, more advanced exercises will be prescribed in order to challenge the ability of these muscles and ensure they can stabilize the spine during everyday functional activities. In addition to your posture your gait will also be reviewed. Pain in your back can not only affect your static posture but can also cause you to develop an inefficient walking pattern that puts unnecessary stress on the joints in your lower extremities and your back. In a normal day most people take thousands of steps just to get around therefore an inefficient or improper walking pattern can quickly lead to further pain in the back itself or can cause pain in other related joints. Your physiotherapist will assess your gait and ensure that you are walking properly. Your therapist may also suggest the use of tape or a back brace in order to help manage your back pain and encourage proper posturing and alignment. Tape can be a useful method to assist the muscles to support your back. 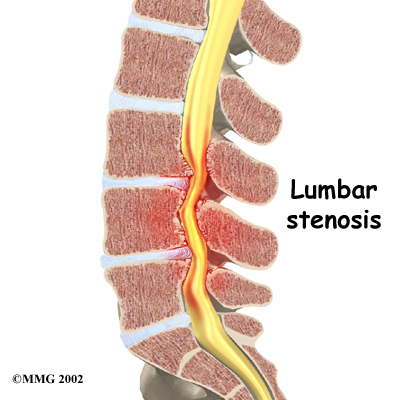 A brace can help to support your back long-term particularly during prolonged static or active periods. Sometimes a trial of tape before an expensive brace is purchased is a good method of determining the potential use of a brace. Your physiotherapist can discuss whether or not they feel a brace would be useful in your individual case. Once your back pain is under control your therapist will discuss the importance of a cardiovascular program to assist in managing your back pain long-term. At The Avenue Clinic we believe that maintaining your overall fitness level is an effective method in helping to manage both the pain and stress that comes with chronic pain and also helps to decrease the number of flare-ups that occur. Your therapist can discuss with you the best cardiovascular activity options that would be appropriate in your individual case. Often cycling, water aerobics, water running, or other low impact activities are the most appropriate ones to begin with when starting cardiovascular activity after an epidural injection. Generally the treatment we provide at The Avenue Clinic for your back after an ESI can assist greatly in managing your back pain but it should be remembered that these injections are not generally a cure for your chronic pain; they are only a part of your overall pain management plan. You will need to continue working long- term with your doctor, physiotherapist, and any other health care professional involved in your pain management. You will also need to continue faithfully doing your rehabilitation home program in order to best manage your pain. If your pain is ongoing despite the injection and regular physiotherapy treatment your doctor may want to discuss the possibility of another injection or other pain management options. The Avenue Clinic provides services for physiotherapy in Swindon.